Anyone who knows me knows I love pasta. It’s easy and quick to make, there are thousands of variations between the shape of the pasta and the ingredients you pair it with, and above all it tastes great. It’s the food I most often crave and definitely the one I most often make. 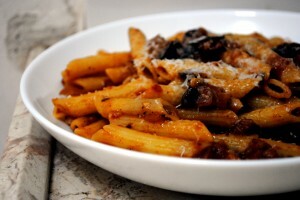 It was time for dinner so I surveyed the ingredients we had on hand: pasta, eggplant, garlic, onions, grano padano, wine, sauce. Done. Cooked all together the resulting dish was even better than I thought it would be; more than just a quick meal, this is something I want to eat all the time. Bring a large pot of water to a boil. 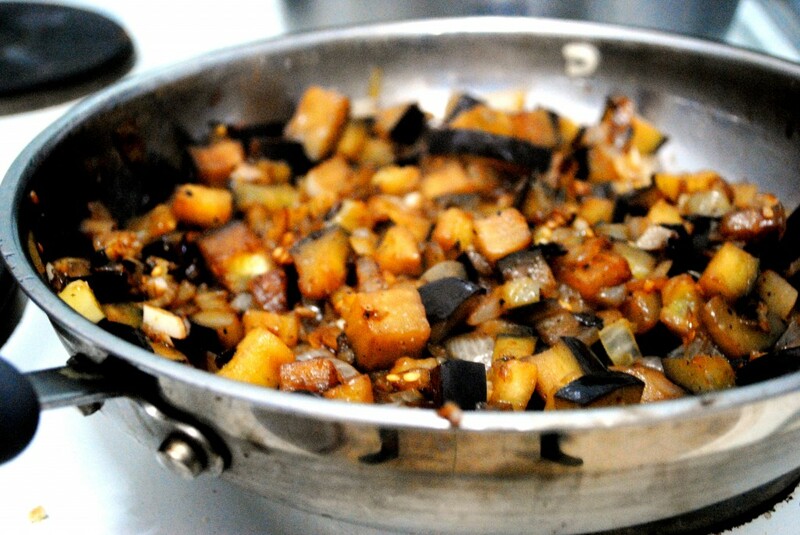 Meanwhile, sauté the eggplant, onion and garlic in the olive oil until tender. Add the red wine, scraping up any bits from the pan, and allow to reduce by at least half. Add the sauce and stir in the cheese and allow to simmer over low heat. Meanwhile cook the pasta until just al dente. Add about ½ cup of the pasta water to the sauce before straining. Add the pasta to the sauce and mix to combine. Allow to finish cooking and absorb the sauce. Serve in bowls with additional grated cheese on top.